taganrogcity.com | The President of Russian Federation Dmitri Medvedev participated in celebrating the 150th anniversary of the great Russian writer Anton Chekhov in the writer's home city of Taganrog. 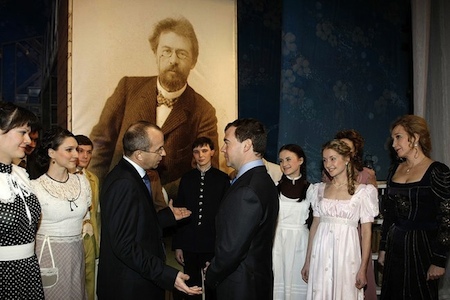 The President of Russian Federation Dmitri Medvedev participated in celebrating the 150th anniversary of the great Russian writer Anton Chekhov in the writer's home city of Taganrog. 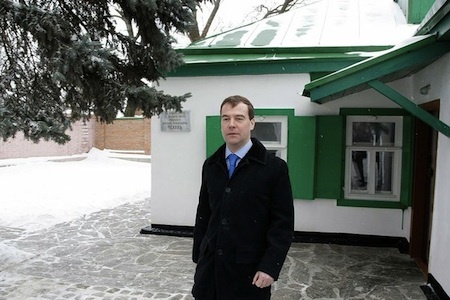 President Medvedev visited the city of Taganrog to participate in celebrations of the 150th anniversary of the great Russian writer Anton Chekhov in the writer's home city of Taganrog. 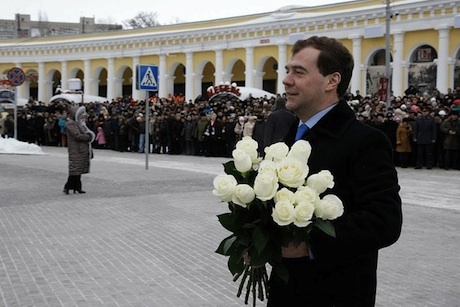 Dmitri Anatolievich Medvedev laid flowers at the Chekhov monument and met with local residents. He then visited the Chekhov Birth House Memorial Museum, and the Taganrog Chekhov Drama Theater, where he watched a rehearsal of the performance "Everything Starts in the Childhood", dedicated to Anton Chekhov. Dmitri Anatolievich Medvedev later visited the "Chekhov Gymnasium" Literary Museum, located in the building of the former classical school for boys, where Chekhov studied, and met with representatives of the Russian and foreign theatrical communities, with whom he discussed the problems facing theatre today. Among the participants of the meeting were: actor and director Oleg Tabakov (Russia), director Jacques Lassalle (France), director Andrey Konchalovsky (Russia), director Matthias Langhoff (France), actress and manager of the Comédie-Française Muriel Mayette (France), theater director Azer Neimatov (Azerbaizhan), theater director Akop Kazanchan (Armenia), art director of the Volksbühne Frank Castorf (Germany), theater director and manager of the Drama Theater of the Byelorussian Army Alexey Dudarev (Byelorussia), director Peter Stein (Germany), theater director and art director of the National Academic Yanka Kupala Theater Nikolay Pinigin (Byelorussia), director of Lenkom Mark Zakharov (Russia), theater director, actress and composer Maria Bonzanigo (Switzerland), art director of Ivan Franko National Academic Drama Theater Bogdan Stupka (Ukraine), director of Teatro Sunil Daniele Finzi Pasca (Switzerland), Russian minister of culture Alexander Avdeev, mayor Nikolay Fedyanin and director of Taganrog Chekhov Theater Sergey Gert. 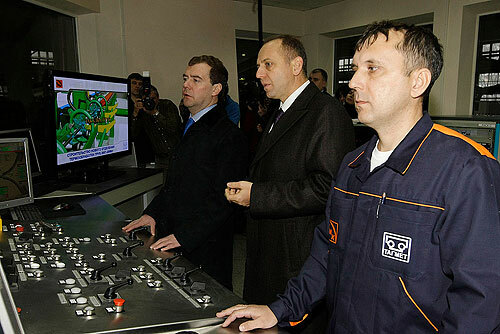 Russian President also visited the production sites of the TAGMET factory. At the Taganrog Metallurgical Works the President visited the pipe-rolling workshop, where a new production line has been launched for manufacturing high-resistance oil and gas pipes able to be used in continental shelf and Arctic oil and gas fields.